CHOOSING a player of the match can sometimes be difficult when three or four individuals are often battling it out for just one award. However, there was no need for a debate about the best player in Sunday’s match. Inagh centre-forward Fiona Lafferty stood head and shoulders above most players on the field. In addition to scoring 1-4, including a vital goal in the 39th minute, her workrate, tackling and general support play for her colleagues was immense. The talented centre-forward scored an impressive 5-49 out of Inagh’s 20-54 during the course of their All-Ireland campaign and is one of the reasons why the Phil McBride Cup is now resting in Inagh. Camogie president Joan O’Flynn, who presented the player of the match award to Fiona, said she had shown “outstanding leadership, huge energy, huge commitment and never-say-die attitude throughout the year and particularly during the final”. A former All-Star nominee, she also excels at ladies’ football, winning an All-Ireland intermediate ladies’ football medal in 2009, a junior camogie All-Ireland medal in 2008 and senior football and camogie championship medals with St Joseph’s Miltown and Kilnamona respectively. Her sister, Siobhán, also has the same bulging sideboard, having lined out with the same teams. Based in Carrickmacross, County Monaghan, the 21-year-old school teacher came home most weekends for matches since starting school in September. The Kilnamona dual star admitted she is looking forward to the break after a long few weeks. Looking back on the first half, Fiona felt they won plenty of possession yet registered a lot of wides and had shots dropping short in the hands of the Tara custodian. She admitted the team was a little concerned with their three-point interval advantage, having played with a very strong wind in the opening half. “The breeze did die down a bit in the second half. We knew we had to go out and battle hard in the second half and that’s what we did,” she said. 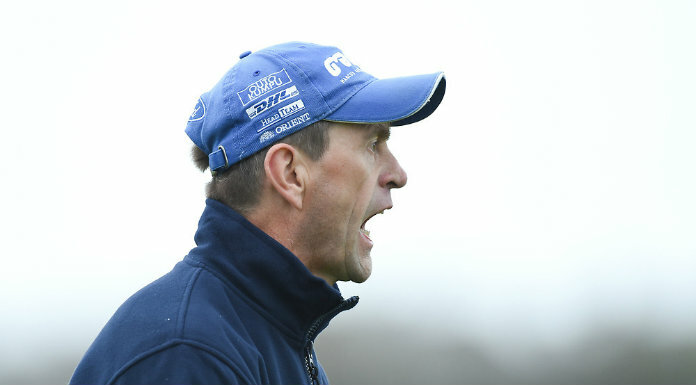 Having watched Corofin reach an All-Ireland decider last year, Fiona said they felt there was no reason why they or any other intermediate club team in Clare couldn’t follow in their footsteps once they played to their potential. “We took one game at a time. We hadn’t all our players during the league. After losing the league final against Truagh-Clonlara, we really knuckled down to training. We said we would give this one hell of a shot,” she said. She acknowledged losing that game as a result of a late goal from a 45’ proved to be a motivating factor, as they didn’t want to lose another big game by a narrow margin. “Noel Hehir made a valid point in the dressing room before the final. He said even though Four Roads went nine points up in the semi-final, this didn’t mean the game was over for Inagh and equally when you go nine points up, it doesn’t mean you have the game won. “We knew we had to give it everything here today. To win an All-Ireland title without our captain, Michelle Wynne, on the field of play shows the strength in depth in the squad. “Any day a club team brings an All-Ireland title back to Clare is a huge boost for camogie in the county. Now that Inagh are going senior, hopefully we will give the likes of Newmarket and Kilmaley a run for their money,” she said.